South Sudan is the youngest and one of the most volatile nations in the world. After two decades of war, it gained its independence from Sudan in 2011. Peace, however, was short-lived. As oil prices plummeted and competition intensified, an ill-advised decision to cut off all oil production was made only six months after the War for Independence. Oil being its largest resource, this loss of revenue crippled the South Sudanese economy. Since 2011, South Sudan has experienced fragility from food insecurity to political violence. When President Salva Kiir dismissed Vice President Riek Machar over corruption charges, the political conflict escalated into full-scale civil war. Ethnic militias, divided between Kiir’s Dinka tribe and Machar’s Nuer tribe, have clashed in the capital city of Juba since the political upheaval began. There is no end to the violence in sight because neither side trusts the other and pre-independence tribal divisions still run very deep. Political and military instability plague South Sudan, but economic depression and mass starvation have resulted from the civil war as well. Cutting off oil production sent the economy into a recession it has not recovered from. International sanctions designed to force the government to provide aid to its people, combined with political upheaval have decimated the South Sudanese economy. Corruption amongst political and military elites has diverted foreign aid to just a few kleptocrats rather than the starving population. Even in relatively stable regions, food insecurity is rampant. Controversy over the allocation of the Nile River’s resources has created a water crisis that threatens thousands annually. South Sudan is an unpredictable country that has yet to shake its colonial and ethnically oppressive institutions. Until Kiir and Machar come to peace terms, the ethnic fissure will remain, widespread violence will continue, and the humanitarian crisis will deepen. In 1956, Sudan gained independence from the Anglo-Egyptian condominium that had colonized the region. Barely a decade later, Sudan fell into two civil wars. 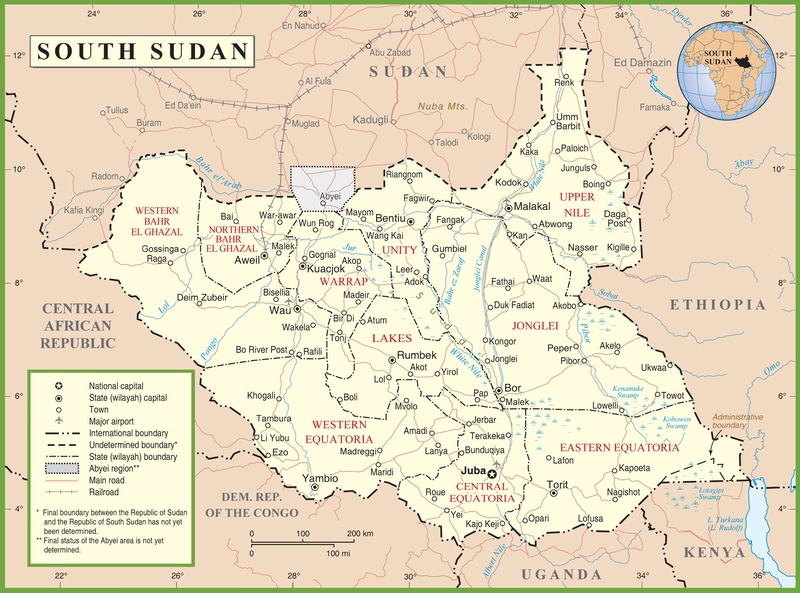 The second lasted from 1983 until 2005, after which an Autonomous Government of Southern Sudan was formed. The independent state of South Sudan formally emerged on July 9th, 2011 via a referendum that passed with 98.83% of the vote.1 Since then, South Sudan has been unstable at best. In 2013, President Salva Kiir accused his former deputy, Riek Machar, of attempting a coup d’état, thus igniting the South Sudanese Civil War. Uganda and Kenya deployed troops in an attempt to stabilize the region with little success. After a peace agreement in 2016, Machar was named Vice President and returned to the capital. Soon after, fresh fighting broke out in Juba and Machar was forced to flee the country. The war has claimed the lives of an estimated 50,000 - 300,000 people and has left the country in a state of dire fragility.2 There is no peace in sight because it is both a political and an ethnic war. South Sudan’s government functions through corruption and their political institutions have failed. Their people are thirsty and starving, and tribal warfare has lead to so many atrocities that both sides refuse to negotiate. The United States has attempted to address this corruption with arms embargos. The government needs advanced weaponry to defeat the opposition, and their arsenal is mainly imported. Special Envoy to South Sudan, Donald Booth believes that an arms embargo could be effective, but without the support of the UN Security Council (Russia and China oppose an embargo), the sanctions carry little weight.9 If the United States refuses to sell weapons to South Sudan, they simply buy them from the Chinese or Russians. Although ethnic and political strife play large roles in the current civil war, those are not the only factors. Poor military institutions play a role as well. In the United States, the military is professionally trained and swears to protect the United States of America. Their professionalization makes them less likely to participate in an insurrection while also making them extremely effective at ending them. In South Sudan, the military is splintered into ethnic divisions and officers are bribed by both sides for their services.10 The army is not uniform in its allegiances, nor is it professional. If it were, generals would not accept bribes and the army would be able to prevent the violence from spreading to rural areas. Corruption extends to the regional protection forces from Uganda and Kenya as well. They are poorly equipped, which hampers their ability to aggressively patrol. They often accept bribes from local governors to avoid certain areas.11 This creates a climate of acceptable corruption from both government and foreign forces while allowing violence to spread, unchecked. Curtailing corruption within the South Sudanese government and military would greatly improve the state’s stability as well as its sovereignty. Unfortunately, corruption is so rampant and lucrative that curtailing it in the short term is difficult and unfeasible. With no coherent plan for the international community to intervene in the civil war, the end of hostilities must come from within the state. The institutions meant to foster political order and physical security have failed. Institutional weakness is a product of South Sudan’s relationship with Sudan. Pre-independence, Sudan employed ethnic militias to conduct counterinsurgency operations against southern rebels.12 It was easier to govern the south by dividing it, so the Sudanese government implemented a system in which governors of different ethnicities were pitted against each other. This ensured that the tribes would not unify in rebellion against the North.13 Unfortunately, government officials in South Sudan recognized “divide and conquer” as a winning strategy and employed it themselves.14 Their administrative institutions benefitted select groups, leading to violence and institutional collapse. Another institutional challenge has been handling its rich oil reserves. After The War for Independence, South Sudan controlled 75% of the oil fields previously owned by Sudan.15 Sudan’s government still wanted a stake in that oil, but South Sudan refused. With the threat of a Sudanese invasion, President Kiir decided to pause oil production country-wide. This brought the oil - based economy to an immediate halt. A representative from the World Bank went to South Sudan to convince Kiir to recommence production, but Kiir and his ministers refused. It was apparent that neither the President nor his ministers were aware of or cared about the economic implications of the shutdown.16 Leadership experience is paramount to stability and because the entire South Sudanese government was new to setting up administrative institutions, the institutions were weak and poorly managed. Poor decision making by the government has weakened South Sudan economically and the return of refugees from The War for Independence has further strained economic institutions. There are limited resources and opportunities for work because of South Sudan’s instability. The return of over 360,000 South Sudanese refugees since 2011, coupled with drought conditions has exacerbated economic strain and driven up food prices.17 Price increases are the result of trade restrictions between Sudan and South Sudan. The water available to South Sudan for irrigation has declined significantly during the civil war because the government spends little time negotiating fair access to the Nile River.18 The entire country faces food and water insecurity, but almost nothing is being done to address it. One issue that South Sudan seemingly has no capacity to combat is its youth bulge. South Sudan has a high volume of citizens under the age of 40.19 These people need jobs and wages to ensure future stability. Due to poor institutional implementation, neither jobs nor stability exists. Fighting for a militia or the South Sudanese Army pays. It also provides shelter and food security to young men who would not normally have either. While young men are recruited to continue the civil and ethnic violence, women are not receiving an education. Only 16% of women are literate, which means that 84% of women will have an even harder time finding work.20 That wastes much of the country’s human capital and potential workforce productivity. While corruption and institutional weakness plague the government’s ability to function, food and water insecurity is the number one concern for the South Sudanese people; especially outside of Juba. In early 2012, one year before the civil war, the UN World Food Programme reported that about 4.7 million people (37% of the population) were at risk for food insecurity and about one million (11%) were severely food insecure.21 Since then, the situation has deteriorated considerably. Studies of the Northern Bahr el Ghazal and Warrap states, which have been relatively stable, show that 100% and 93% of those households, respectively, were food access insecure.22 Food insecurity stems from either a physical or a financial inability to acquire sustainable and nutritious food, but most people in South Sudan are food insecure because does not reach them. Food rarely reaches rural communities because government elites steal it or militias intercept it coming out of Juba.23 Most of this food, which comes largely from foreign aid, is wasted because donors cannot guarantee that it reaches its target. Water insecurity is just as challenging. South Sudan has physical access to the waters of the Nile River, but there is a legal dispute over a treaty between Sudan and Egypt from 1959 that allocated water rights for drinking and irrigation.24 The question is, does that treaty apply to South Sudan as well? While it was legally established that South Sudan would retain control over 50% of former Sudanese oil fields in South Sudan, there is no treaty addressing Nile water allocation.25 This has made it nearly impossible to transport water to people in rural areas of South Sudan and has killed its agricultural sector, thus exacerbating the crisis. Food and water insecurity throughout South Sudan must be addressed, but change is unlikely until the civil war ends. This will leave millions of South Sudanese citizens without a source of food or income. Their desperation could push them to join and continue the fight. Before South Sudan’s independence, Sudan governed the region by pitting tribal militias against one another so that they would never consolidate and threaten the Sudanese government. This turned neighbor against neighbor for years. There was even distrust during The War for Independence when ethnic groups were supposedly fighting for the same cause. Inter-tribal conflict sowed a deep distrust between the Dinka and Nuer in independent South Sudan. Not only has ethnic violence engulfed South Sudan, but widespread famine and mass displacement continue to destabilize the country. Military and governmental corruption continues as well. 10.32% of South Sudan’s GDP, is spent on its military28 (mostly in bribes).29 The economy is tanking. There is limited food or water availability. There is widespread displacement and mass killings. Amid all of these problems, however, over ten percent of the GDP somehow still goes to the military. That is why South Sudan is and will remain unstable and unsafe. Part of the reason peace seems nearly unattainable is because both sides have used social media and radio networks to proliferate hate speech against the opposition. This is similar to Hutu Power’s use of the radio to urge Rwandan Hutus to slaughter the Tutsi minority during the 1994 genocide. Hate speech, supplemented by cynical and corrupt leaders has allowed tribal tension to fester.31 This tension has led to atrocities on both sides and there is seemingly too much hate to be reconciled. The only chance South Sudan has to survive and become a stable member of the African and international community is if Machar and Kiir agree to end the conflict and rebuild their young country. Instead of intervening militarily, as Uganda and Kenya have done, nations should focus on mitigating the conflict through negotiations. They should also continue to provide aid to South Sudanese refugees who have fled the violence.34 A higher priority must be placed on food assistance, medical aid, and implementing sturdy institutions in order to stabilize the country. Food and water insecurity are rampant even in politically stable areas. The international community must prioritize providing aid to starving South Sudanese citizens. The peace agreement that was struck in 2015 had no chance of sticking and no peace agreement in the near future will stick for multiple reasons. First of all, Machar and Kiir have not demonstrated that they are willing to reconcile their differences for the good of the country. Secondly, the funds do not exist to make sharing power worthwhile. The country is in economic crisis, but it is personally lucrative for Kiir if he remains in power. Finally, two armies who bitterly despise one another cannot provide security to Juba.36 Both sides have committed war crimes so it would be a bit naïve to believe that violence could reignite without the same crimes occurring. Unfortunately, South Sudan’s future appears bleak. They have such deeply entrenched corruption and ethnic divisions that violent conflict was only a matter of time. The fighting has led to organized killings that have claimed thousands of lives. The tanking economy and government’s failure to provide basic goods and services has caused mass starvation and displacement. Their troubles come from within and must be solved from within before any type of stabilized government can take hold. Foreign aid can contribute to rebuilding the country, but at the end of the day, the only people who can end the civil war are the ones who started it. South Sudan’s situation is not hopeless, but South Sudanese lives will not improve until those entrusted with governing and protecting decide that their country is more important than money. de Waal, Alex. 2014. “When Kleptocracy Becomes Insolvent: Brute Causes of the Civil War in South Sudan.” African Affairs 113, no. 452: 347-369. Academic Search Premier, EBSCOhost (accessed October 4, 2016). What would become South Sudan. CIA World Factbook, “South Sudan.” October 4, 2016. https://www.cia.gov/library/publications/the-world-factbook/geos/od.html. The Brookings Institute, “U.S. House of Representatives Subcommittee Holds Hearing on the Deteriorating Situation in South Sudan,” October 4, 2016, https://www.brookings.edu/blog/africa-in-focus/2016/09/09/africa-in-the-news-us-concern-over-south-sudan-the-g-20s-mixed-reviews-and-south-africas-positive-growth-trends/. Council on Foreign Affairs, “Understanding the Conflict in South Sudan,” October 4, 2016, http://www.cfr.org/south-sudan/understanding-roots-conflict-south-sudan/p38298. This strategy ultimately failed, as the tribes in the South did eventually join to fight Sudanese oppression. Tappis, Hannah, et al. “Food Security and Development in South Sudan: a Call to Action.” Public Health Nutrition 16, no. 9 (September 2013): 1631-1636. Academic Search Premier, EBSCOhost (accessed October 4, 2016). D’Agoôt, Majak. “Coping With Traps of Vulnerability: a Review of the Impact of Post-Colonial Issues on the Independence of South Sudan.” Defense & Security Analysis 29, no. 2 (June 2013): 104-116. Academic Search Premier, EBSCOhost (accessed October 4, 2016). Omer, Reem. “South Sudan: From Independence to a Detrimental Civil War.” Harvard International Review 37, no. 3 (Spring 2016): 11-12. Academic Search Premier, EBSCOhost (accessed October 4, 2016). Highest percentage of a country's GDP spent on the military in the world. Comparatively, the United States consistently spends between three and a four percent. The Economist, “Why South Sudan is Still at War,” October 4, 2016, http://www.economist.com/blogs/economist-explains/2016/10/economist-explains-0.